The arrival of a new single by Ases Falsos triggered a recent mandate: making justice to the first album by Las Chaquetas Amarillas, one of the many bands by Chile’s most understated and active music genius, Cristóbal Briceño. Diez Primeras Canciones had a sketchy release back in December, right amidst the chaos of the holidays and best-of-the-year lists. Needless to say the album has been overlooked. 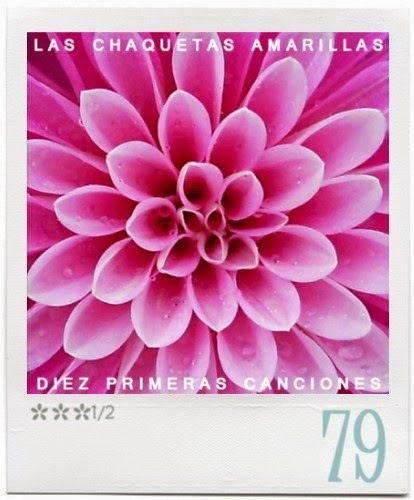 While far from the attraction and assaultiveness of Juventud Americana, the first record of Las Chaquetas Amarillas is an enchanting collection of songs that merits a proper listen, and a proper review. When approaching Las Chaquetas Amarillas, it’s hard not to raise an eyebrow and question whether the conception of this band was even necessary. Briceño already has an output for arena-rock anthems with Ases Falsos, and a channel for exploring melodramatic popular songcraft with Los Mil Jinetes. Finding the purpose of Las Chaquetas Amarillas becomes a nuanced and challenging task. While I could suggest a stretchy theory about the need of its mere existence, it’s best to follow the band’s advice of “keeping it simple”: Briceño likes to write songs (and this is the ninth album he’s written in seven years). Diez Primeras Canciones starts with the stark, self-reflecting ballad “Cuando nuestras mentes,” which initiates a twofold narrative that is both personal and pedestrian. From social-political boiling pots (“Has Hervir” & “Tierra Robada”) to a self-parody episode (“La noche que te conoci”), this is a round record devoid of content. Briceño's ability at matching rock/pop hooks with unlikely melodies shows true exuberance here. Potential singles “Melamina” and “Esta Chiquilla” are extroverted in their construction and mean to shake you –and they sure do. While most of the album could be classified as affecting, the album never hits a false note. That restrained, tongue-in-cheek build up in “Mujer Bonita” might seem prolonged at first, but once that track-changing chorus presents itself (quite abruptly) everything resonates for the greater purpose of sounding catchy and grandeur. While Diez Primeras Canciones has undoubtedly better songs than perhaps any ((destacado)) album this year, its code of conduct at constructing, or to be specific, resolving its pieces is an unfortunate one. Making the conscious choice of obtrusively ending your narrative at the middle of nothing is something only David Lynch can afford (anyone else doing that shows defeat). But even with its flawed construction, Diez Primeras Canciones proves to own unquestionable raw transporting power. Enveloping at the very least.